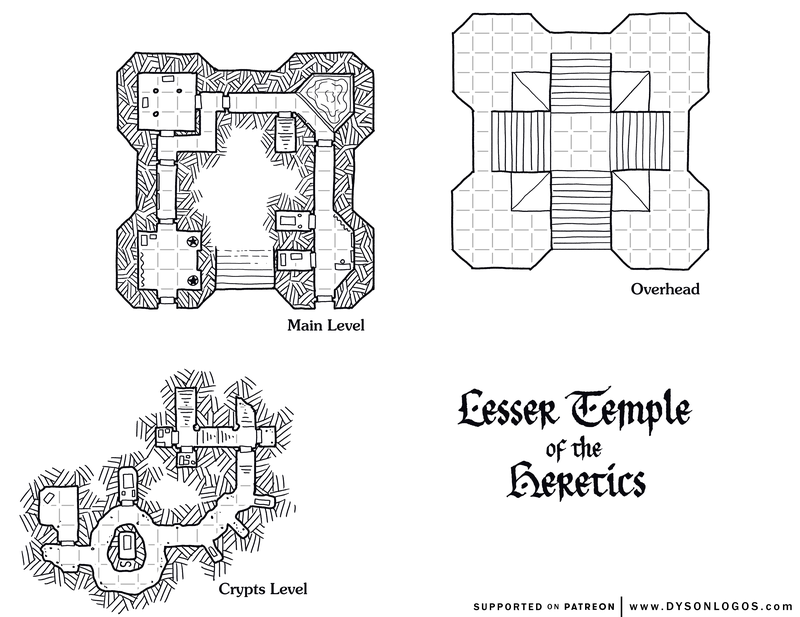 Most of the temples of Zueshel were destroyed after the Seven Heretics struck down the God-King – however a few rebuilt into pyramid-temples dedicated to the heretics themselves. Most of these contain (or at least claim to contain) a holy relic of either the death of Zueshel or from the later deaths of the Seven Heretics. This particular temple claims to have the son of one of the seven heretics entombed in the reliquary below it. It serves both as an administrative centre of the rural province it is in as well as a place of quiet contemplation. Pilgrims carry water to the temple and pour it into the pool in the northeast corner as they silently ask for the intervention of the heretics or the child below into their daily affairs. 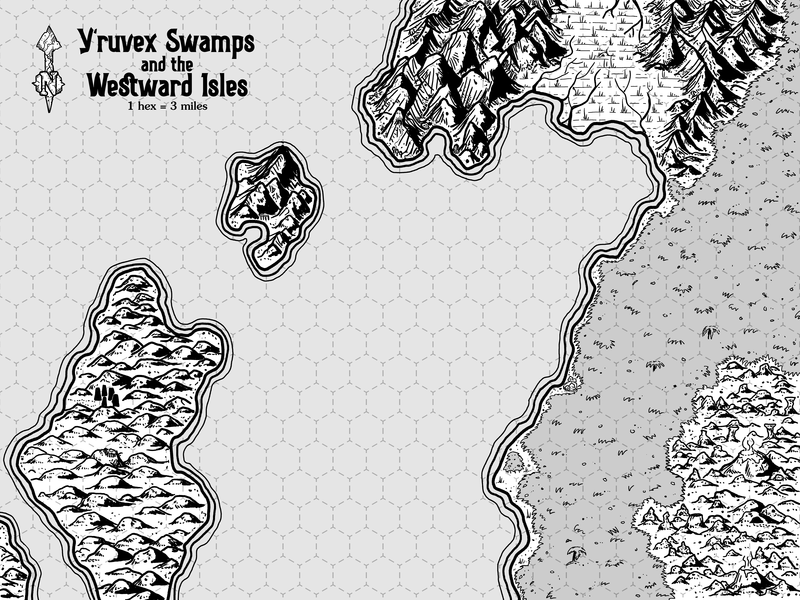 These lands were once the territories of the god-king Zueshel who was struck down by the Culling Blade wielded by each of the Seven Heretics in turn. Through the blade it is said that they each gained a portion of his power. Modern heretics say that this runs against the very beliefs of the Seven Heretics, who struck down Zueshel while announcing that he was no god to begin with. Regardless, with the end of Zueshel’s reign, the people turned their worship to the Seven Heretics and a number of temples were built around the land. The greatest of these is said to house their bodies in a secret crypt, where they remain as they were when the heretics died – never decomposing. A small fortification near the Hewbank in the Eagle Hills, Brenovale Castle was abandoned a few years ago when plague struck. By the time help arrived, those left behind were dead and bloated, surrounded by foul insects that appeared to carry the infection. Constructed rapidly through wizardry, the castle remains effectively untouched today – the only sign that anything has changed is the lead plague seals on the front doors have been broken, and no sign of the infected dead can be found within. 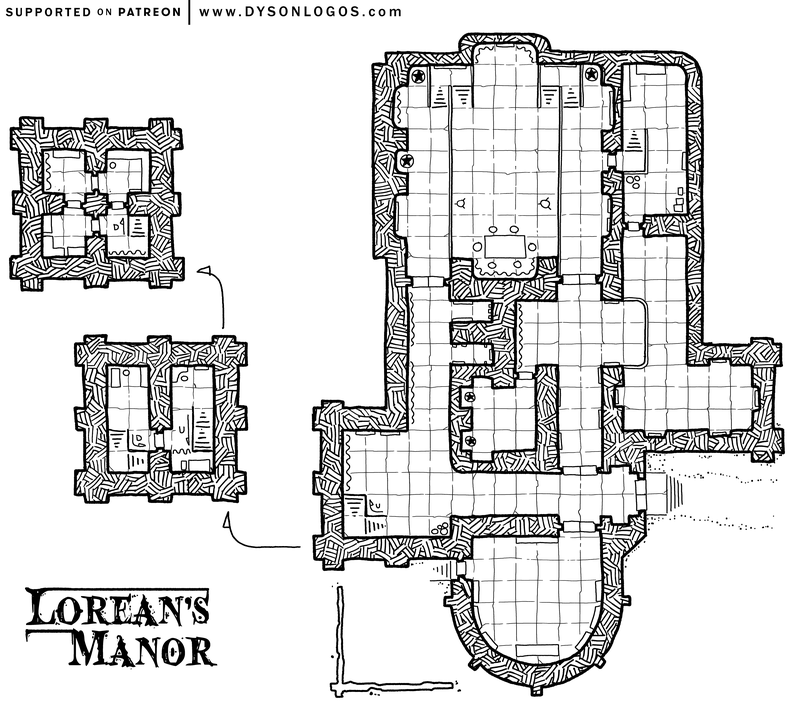 Part of a much larger estate that has fallen to advanced decrepitude, Lorean’s Manor sits on a hillside rank with overgrown weeds and brush. Somewhere in the untended brush are a number of collapsed and half-collapsed outbuildings including the kitchens and staff buildings, coach house, and so on. Standing before these overgrown gardens and ruins is the Lorean’s Manor. 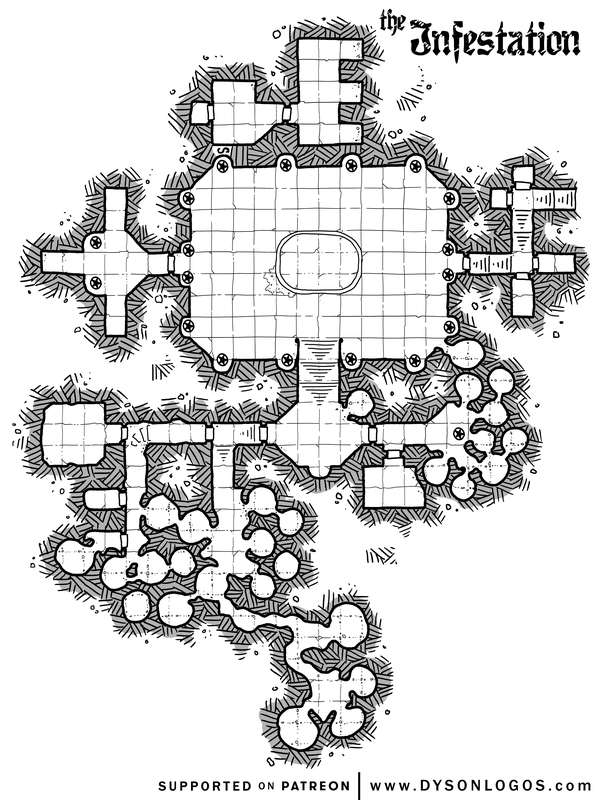 The lowest parts of the structure are hidden by errant trees and heavy ground cover, but the high arched roofs and tower make it impossible to miss for now. 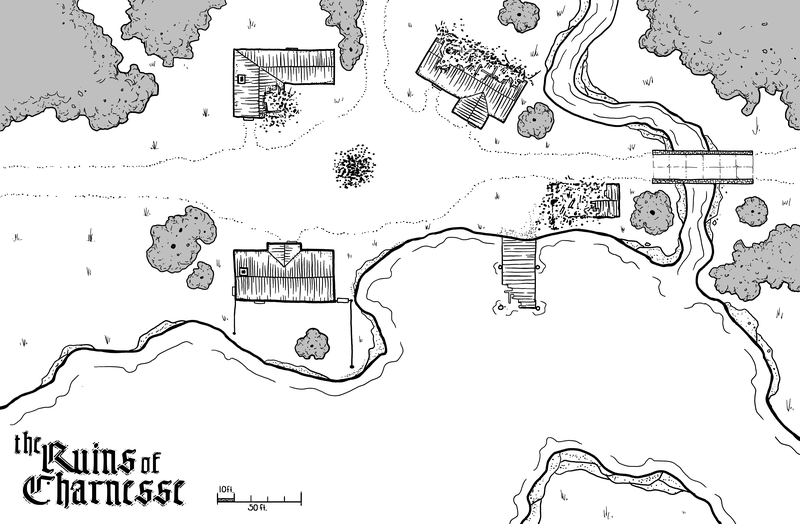 It is to this decrepit estate that Rosalinde Lorean returned from her studies among the mages of the Hill Islands. With the death of her great aunt, she is now head of the estate and tries to keep things in order while entertaining her great uncle’s delusions that the estate and family are still as important as they were in his youth. As the estate has almost no money, Rosalinde has replaced the staff with faerie folk that she rescued from a collapsing faerie circle during her time on the Hill Islands. These fae provide the family with food as well as cobbler and seamstress work (although they certainly don’t do any yard work). They flit in and about the old structures where fanciful mushrooms now sprout. Release the Kraken on the Portal Nexus! The votes for February’s “Release the Kraken” have dug up a wonderful piece from 2015 – The Portal Nexus! The Portal Nexus is a set of odd interlinked towers with no ground floor entry (but a few upper level doors that lead into the towers from walkways and balconies). Enterprising thieves and those with means of flight can access the nexus via these upper level entries, but the design of the structure assumed that all persons entering and leaving the nexus would be doing so via portals. 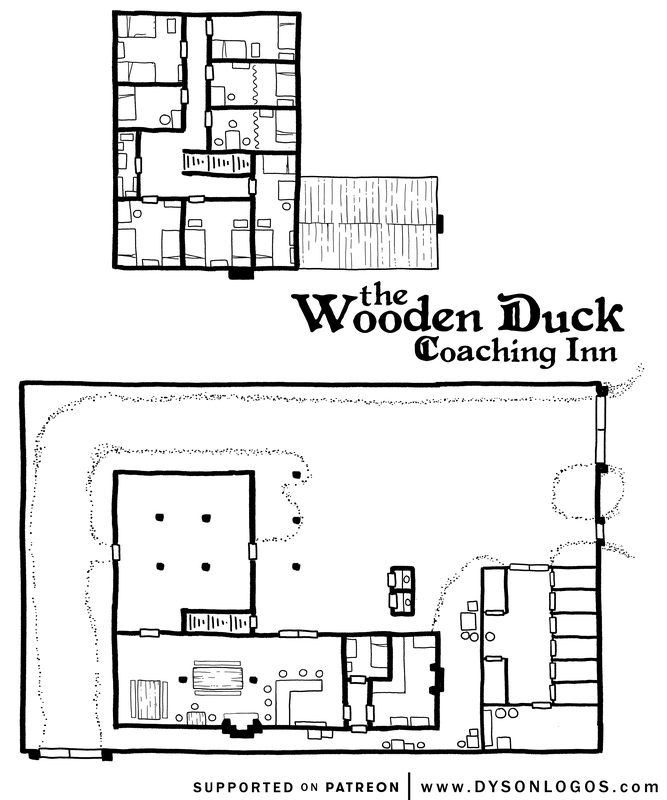 The top level (level 4) is two towers connected by a covered bridge. I picture a single portal right in the middle of the bridge, so you can’t actually use the bridge to get from tower to tower without crossing through the portal. The next level down (level 3) is three towers, two of which are connected by an open-air bridge. 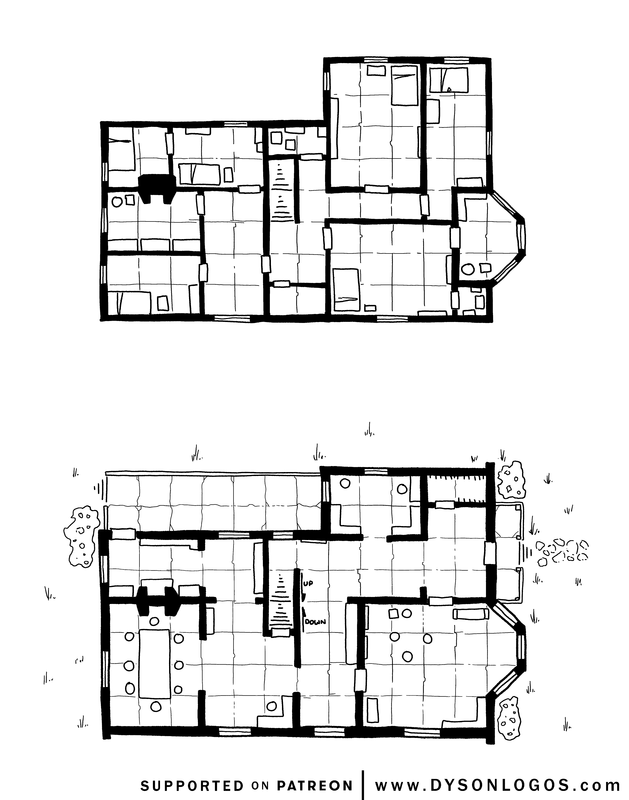 The tower on the left I picture as having two portals, at the two dead-end regions of the c-shaped room. The level just above the ground floor (level 2) is comprised of multiple towers, and also is home to the only open-air portal of the structure. There is a large pillar made of green stone sitting on the roof of one of the smaller towers and reached by a bridge – when activated it calls down a bolt of green lighting from the skies and is open for travel for ten minutes. The spike-sided tower to the left is also home to three more portals (and a balcony overlooking the stone circle on the main level), each embedded in the wall of it’s own chamber, framed in heavy obsidian blocks. Finally, the ground floor is home to two portals and access to the upper levels. The cellars of Rose Point Manor still show the damage from the fire that destroyed the original manor house. The stone stairs and sections of the walls are scorched and cracked from the heat. 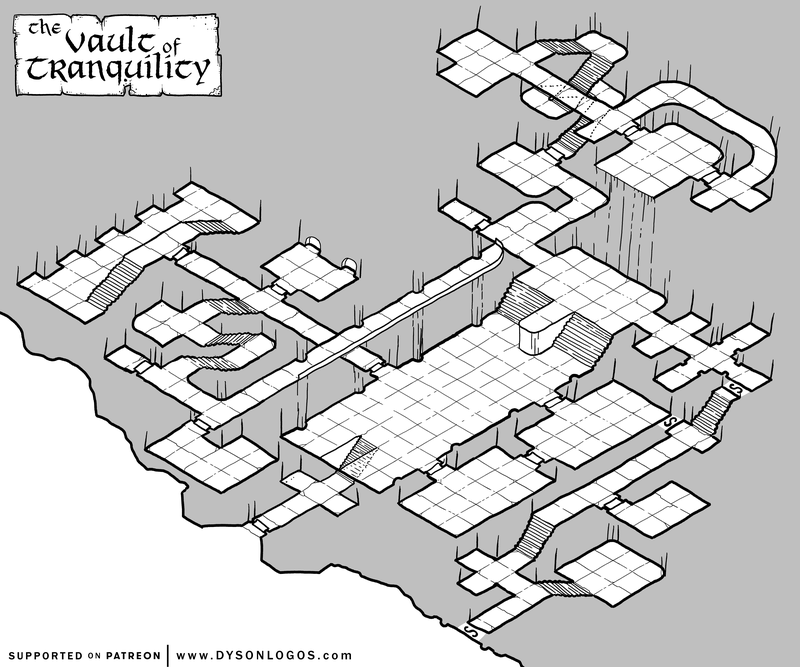 The extended subterranean structures beyond are untouched, but long ignored. The pair of iron doors that lead to the catacombs are both rusted and long unused – the first is in exceptionally bad shape having held the fire back on the night that most of the line of Heare was lost. The locks are seized and will take significant oiling and care to make them work again. The basement contains the usual things you expect to find in such a place – odds and ends from the manor above, a rack of wine, a few pieces of old furniture, and some supplies for potential repairs. Other spaces of note are a small side room set up as a sort of memorial shrine to the bloodline of Heare concealed behind a bookcase, and the manor’s cistern. The lower catacombs were used as a family crypt and a secret chamber beyond the rough catacomb tunnels is decorated with carvings of deeds and people from the long line of Heare. The new manor is almost entirely made of stone – even the elegantly painted window shutters are made of thin slate, and much of the furniture is made of iron and steel. The elven lord of the house, Krennheon Heare, is somber and keeps much to themself, spending most of their time in study and contemplation of the arcane and the past greatness of their lineage. Occasionally guests are admitted to the manor to discuss matters of history or arcane legend – usually in the sitting room with the bay windows at the front of the structure, and occasionally back to the dining room where ancient brandies are shared over even more ancient tales. Up in the hills is a small crater-like depression with a mostly smooth floor and a pair of heavy metal doors that lead to some place in the hillsides. The doors open twice every 6-9 months. Once to allow the Blue Golem into the crater to begin its wandering, and once again exactly 10 days later when the Blue Golem returns. The Blue Golem walks the lands nearby seemingly at random for those ten days – usually just walking from one place to another and then moving on to the next. On rare occasion the golem stops to collect something small and place it in a box build into its shoulder. Usually this is a plant or a small animal, but of course tales include it kidnapping children or seeming to want specific body parts from those that come too near. As you head north along the Brown Goblin river it cuts deeply into the badlands, making it very difficult to cross. Boat traffic becomes prohibitive also because of the speed and roughness of the river up north. Karst Ford marks the last point where a boat can travel upriver – a ford where the river has cut through the local dolomitic stone leaving a path of hard stone that pedestrians and careful horse riders can cross while the river runs swiftly through runnels underfoot. 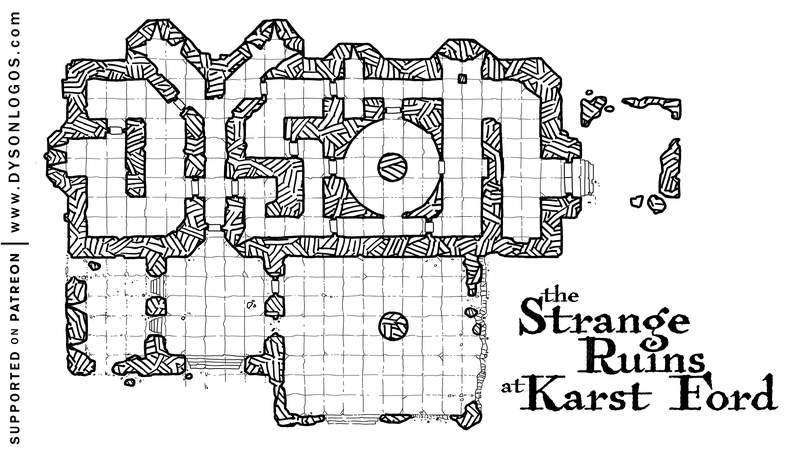 Overlooking Karst Ford is an unusual ruined “palace”. 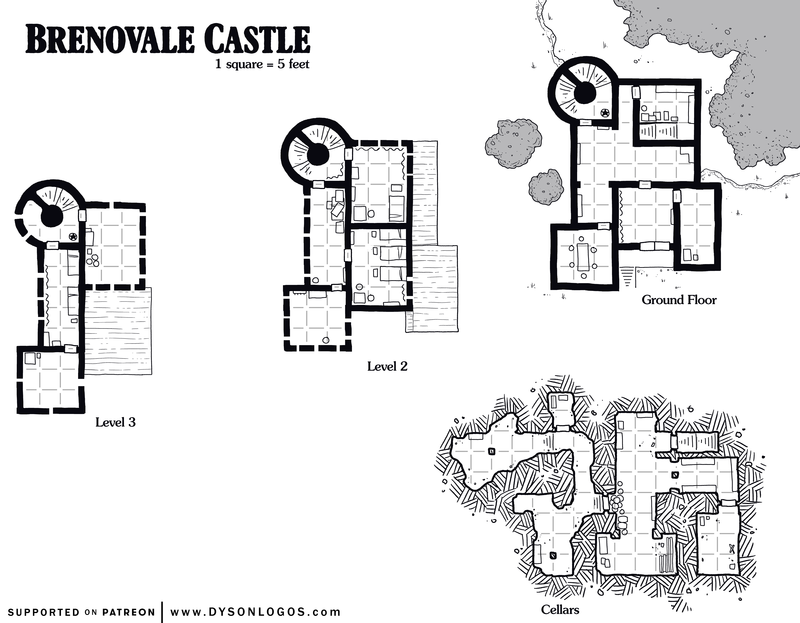 One side has raised open stone structures that appear to be meant to serve as decorative “gardens” or similar, with the structure itself being some nonsensical series of halls and small rooms centred around a circular chamber that was maybe the base of a tower at one point. A few efforts have been made over the years to use the structure as a garrison or guard post along the river, and the circular chamber still has wooden scaffolding within it leading up to the ruined upper level of the structure – probably intended to be used to reconstruct a wooden watch tower over the palace. 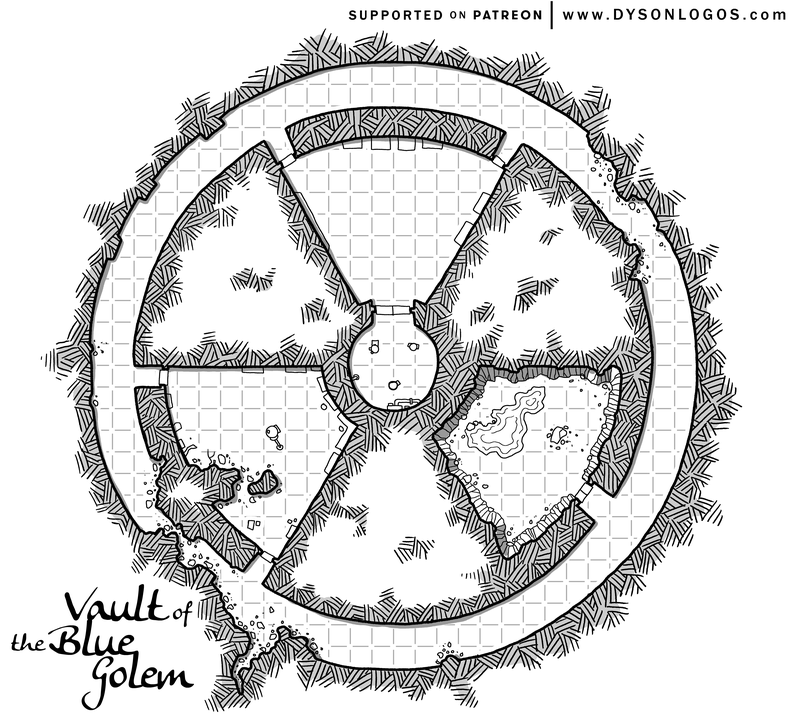 This small “dungeon” is home to a circle of elementalists who focus on water magics (who call themselves the Blue Warlocks). 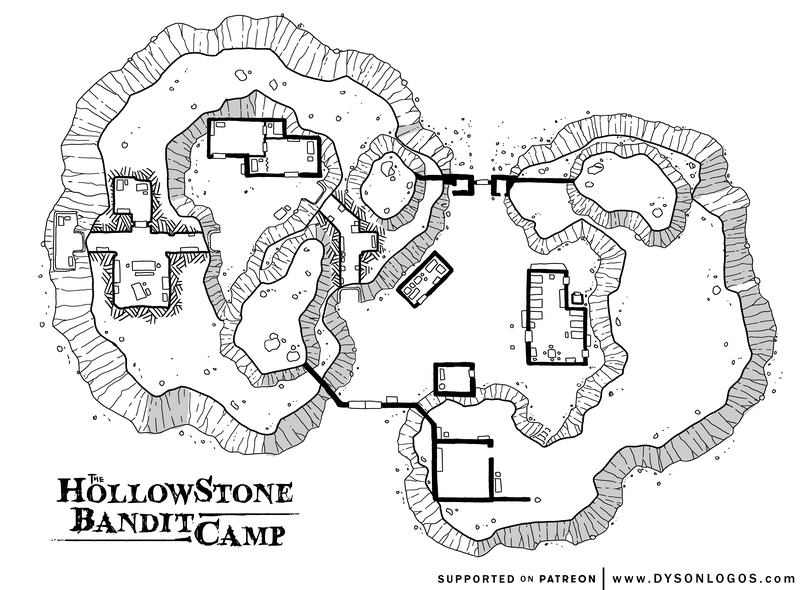 Excavated and expanded upon from a small cave that linked to an underground river, it now serves as workshops, training and teaching space, and as the repository of a small library of elemental lore. 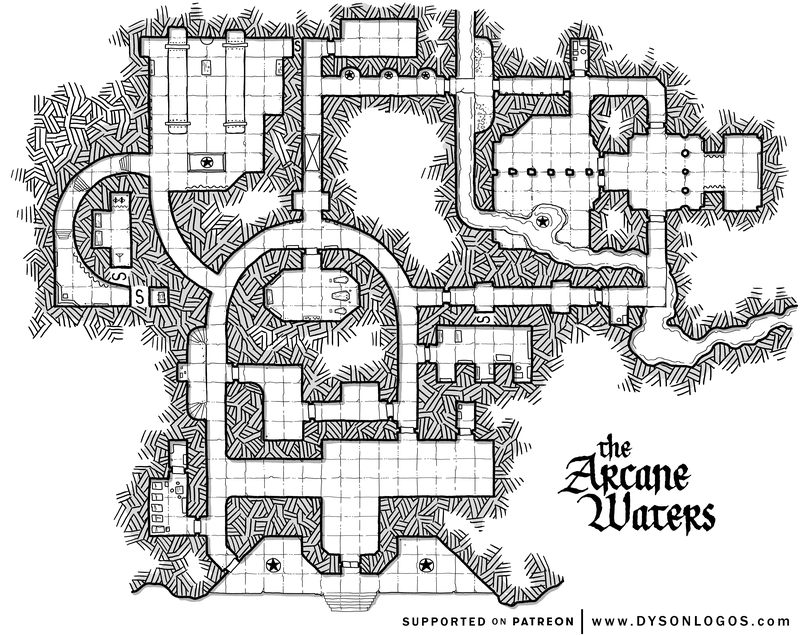 As the name suggests, the waters here are magical in their own right – the Blue Warlocks use these waters to both enhance their magics and potions, as well as in the research into new spells and items. One of the original Blue Warlocks linked the source of the river to the elemental plane of water as well as a trickle of energy from the positive energy plane. 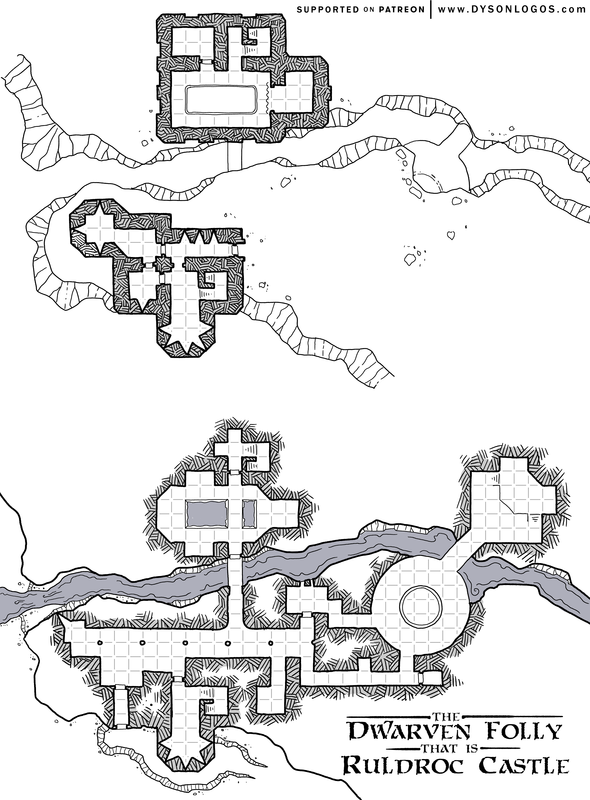 A small asymmetric square tower, Brentil Tower stands alone overlooking Banrior Chasm where the hordes of modronic rats once came crashing into these lands. Currently secured and locked down by the the Sorcerer Lord Iosselmon, barring the use of magics to break in, the only way to unlock the doors are the magical keys distributed to the lieutenants of his Red Rangers. On the nights of the new moon, you can sometimes see the luminous form of someone pacing in the enclosed balcony on the upper floor of the tower. 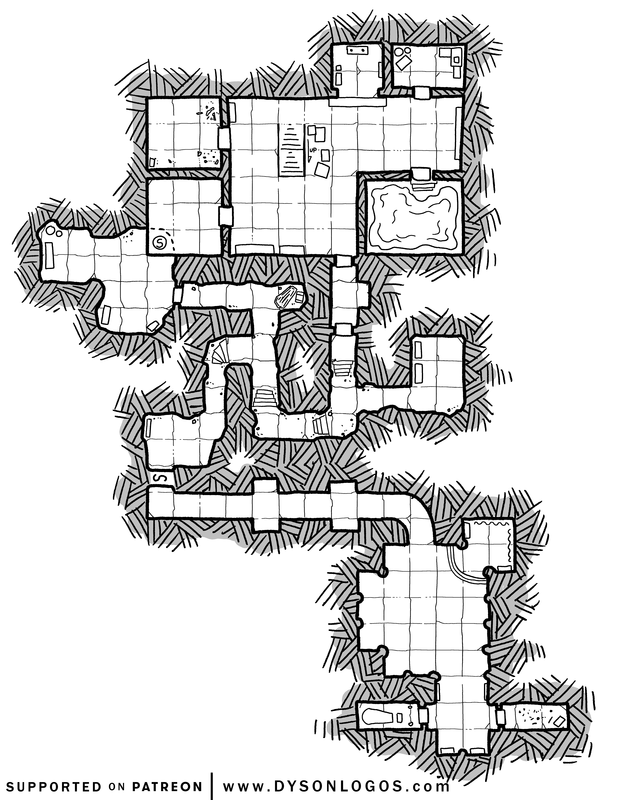 It is said that Iosselmon’s Red Rangers don’t just use the tower to rest on their tours, but that they have to come here in order to feed whoever or whatever is prisoner up there.